A two day break to the Wimmera/Mallee regions of western Victoria to see most of the Southern Silo Art Trail. Most of this area of Victoria is wheat and sheep country and the huge grain silos are in small towns along the railway line where goods trains were loaded. It is rich farming country but always subject at times to either drought or flood.... The silos were places for the farming communities to come together during harvest, exchanging news and stories and connecting with others while the grain was unloaded. However, modern methods in agriculture have changed the practice and many communities have lost the silo sites. We noticed, sadly, many once grand but now deserted public buildings and houses; fine towns now just quiet backwaters. The Silo Art initiative was aimed at bringing visitors back to these places and to inject a new and modern impact through tourism. 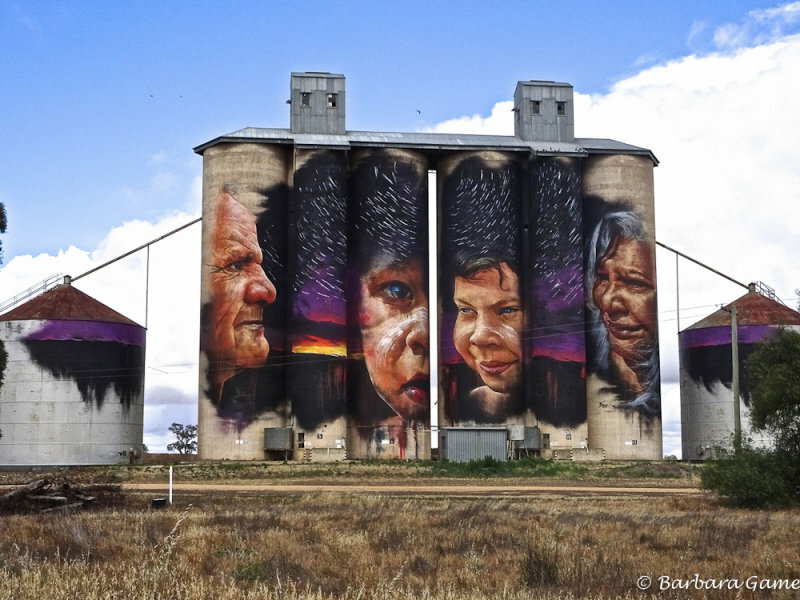 We took another three day excursion in Autumn, 2019, to look at more silo art, this time in northern Victoria in distrcts around around Benalla. We chose to stay in a delightful cttage at the foot of the Warby Ranges in Wangaratta. Again, a pet friendly accommodation and beauifully appointed, it had views across wide paddocks with sheep, horses and distant views of Mount Buffalo. After a record breaking dry Summer, the land is dry and yellow but still very lovely. Rain is badly needed and feed is being trucked in to needy farms. The painted silos are awesome and are bringing visitors and welcome business to the area. Devenish, offered at pub counter! Moving the cows, modern style. An amazing and interesting gallery ! V.
Very interesting gallery, wonderful collection of murals. V.
C’est une galerie très originale et c’est avec plaisir que je découvre ces peintures. Vos photos sont superbement réalisées.